New book, 64 pages, ELI179. 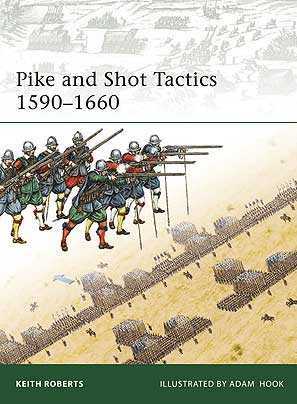 Drawing upon years of research into period documents, this book explains and illustrates one of the key turning points in military history, when the potential of gunpowder infantry weapons was first fully exploited. At the turn of the 17th century the Dutch, revolting against Spain, pioneered this great step forwards, harnessing disciplined mixed formations of musketeers and pikemen to the rediscovered tactical skills of ancient Rome. This doctrine was developed during the Thirty Years War, and came to dominate the battlefields of the English Civil War. Illustrated with contemporary engravings and original colour plates, this book reveals how armies of pike and shot, cavalry and artillery were deployed by Dutch, Swedish, German and English generals, and how they ruled European battlefields for a century. This item was added to our catalog on Tuesday 23 February, 2010.